According to Peter Osborne, art before 1945 was based on ‘a craft-based ontology of mediums’,1 mainly dominated by categories such as painting and sculpture. From then onwards, it moved towards ‘a post-conceptual, transcategorical ontology of materialisations’ – the mix of ‘in between’ or ‘meta’ artistic media such as performance and installation that dominates contemporary practice and with which traditional museums have to contend.2 Osborne shows how this current state of contemporary art is the result of both the de-bordering of media (painting and sculpture mainly) and of previously social spaces for art, mainly embodied by national museums. The latter, he claims, have been replaced with a global art market characterised by large-scale international exhibitions and the migrancy of artists, all fuelled by deregulated capital markets that know no national borders. The task of the contemporary art museum today is to reflect and critically engage with this concept of art and these structures of global capital in which it is deeply entangled. Suzanne Lacy, The Crystal Quilt, 1985–87, mixed media installation. Installation view, 'Art in Action', The Tanks at Tate Modern, London, 2012. Photograph: Tate Photography. Courtesy the artist and Tate, London The opening fifteen-week-long programme of Tate Modern’s new Tanks spaces, ‘Art in Action’ – presented in former oil tanks made useable by Swiss architects Herzog & de Meuron, who are also responsible for the original Tate building – successfully reflected the first of these two aspects of contemporary art, i.e. the shift away from medium specificity towards interdisciplinary categories within art, specifically in installation, experimental film and performance-based practices. Curated by Stuart Comer (Curator of Film), Kathy Noble (former Curator of Interdisciplinary Projects) and Catherine Wood (Curator of Contemporary Art and Performance), this shift was articulated both through the programme’s content and its presentation. Moving rapidly among media and forms of presentation – from evening dance performances and experimental film events to permanent installations and conferences emphasising the discursive and theoretical turn contemporary art has taken since the 1960s – ‘Art in Action’ juxtaposed two generations of artists: those active from the early 1960s to the end of the 80s who consciously explored and experimented with their chosen media and so created new forms within the fields of dance, film and the visual arts, and a younger generation who move more freely among media, as if the borders among them never existed. 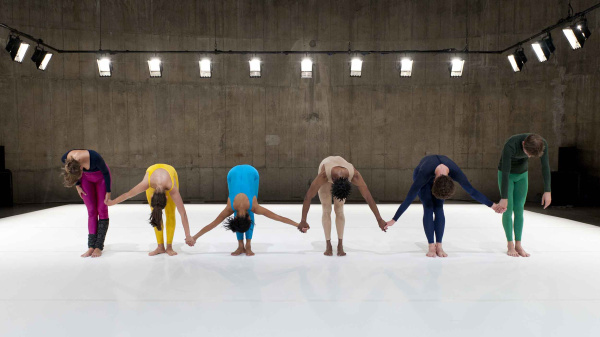 The former were represented by works such as Anne Teresa De Keersmaeker’s Fase: Four Movements to the Music of Steve Reich, which fundamentally changed accepted ideas of choreography when it appeared in 1982. It still amazes with its complex interplay of repetition, synchronisation and gradual phasing, in which the dance appears neither as autonomous from nor dependent on Reich’s music but as something in between those two states. Another work amongst the more established artists was a performance-installation made in tribute to the film-maker Jeff Keen – who passed away earlier this year – in which the audience was encouraged to step inside a massive cylindrical screen hanging from the ceiling, with over twenty projectors simultaneously showing Keen’s quickly moving, violent and absurd films. Other earlier works shown were Lis Rhodes’s Light Music (1975) and Suzanne Lacy’s Crystal Quilt (1985–87); both of these film and sound installations were recently bought by Tate Modern and were on permanent display throughout the programme. The choice of work by the younger generation continued the experimentation with social engaged and event-based practices initiated by these pieces – such as Tania Bruguera’s project Immigrant Movement International (2010–ongoing), which works with recent immigrants towards immigration reform, or choreographer Boris Charmatz’s long-term choreographic project Flip Book (2008/2012), an engaging performance that unfortunately speaks to a still lingering fixation with 1960s dance movements in visual art. Other performances mixed elements from choreography, sculpture and theatre, though at times the mix among these parts was unequally thought through: Eddie Peake’s large-scale performance Amidst a Sea of Flailing High Heels and Cooking Utensils, Part 1 (2012), a co-commission by Tate Modern and Chisenhale Gallery, for example, seemed a short live action drawn out to an hour-long performance and Anthea Hamilton’s Kabuki (2012) was more invested in the intricacy of its Japanese-style costumes than in the interplay among the performers. Sung Hwan Kim’s sprawling installation best underlined the tendency of artists to no longer define their work in terms of set media; it occupied several types of spaces (a narrow dark corridor, a low-ceilinged room with a glass wall through which the visitor could see another massive gloomily lit space) as well as types of media (sculpture, film and participatory work, emphasised through the audience having to walk through the installation). Ambitious conferences and symposia addressed topics germane to the work shown, such as the use of light and darkness in experimental film and the social turn that art took around the 1990s. Considering contemporary art’s close connection to discursive practices, and to theory in general, the choice to include three conferences into the programme provided important contextualisation to the works presented and to the general shift within art that the programme pointed towards. If the curators successfully produced a programme that reflected the status of contemporary art today, it was less convincing in critically addressing the economic parameters on which this art is based. If the curators successfully produced a programme that reflected the status of contemporary art today as well as some of the older artists whose work led to this, it was less convincing in critically addressing the economic parameters on which this art is based. The spaces in which contemporary art emerged as well as the expansion of the art market after World War II are crucial in understanding how the works presented within ‘Art in Action’ can be understood. This is a fundamental point and if addressed would have opened up questions such as: what are the implications of a major art institution like Tate Modern now having bought experimental and socially engaged art works such as Rhodes’s Light Music or Lacy’s Crystal Quilt? How can their original social character be shown within this new framework? The problem isn’t so much the fact that these types of works now have been appropriated and brought into the museum context: this happens to most art at some point. Rather, the problem is that the programme didn’t seem to reflect upon this. Furthermore, what does it mean that these works are presented in raw industrial and unpolished spaces – a type of space that in the late 1970s and early 80s was used by these same artists as an escape away from the art institution and the art market? The programme not merely affirmed how art institutions like Tate Modern now comfortably fill these raw spaces, using former oil tanks in the expansion of the museum, it ironically also reflected the much criticised sponsorship Tate Modern receives from the oil company BP. Considering the scale of the three conferences it is remarkable how none of them addressed any of these issues. Lis Rhodes, Light Music, 1975, film and sound installation. Installation view, The Tanks at Tate Modern, London, 2012. Photograph: Tate Photography. Courtesy the artist and Tate, London In contrast with the programme's lack of reflection upon the intrinsic global economical framework on which contemporary art rests, Hito Steyerl and Rabih Mroué’s lecture performance Zero Probability (2012), which was more explicitly political than most of the newer work, questioned the representational status of the image and by this the museum or even film’s ability to capture it. Merging fiction and documentary, Mroué and Steyerl explored the notion of ‘zero probability’ through mathematics, quantum physics and cinema. For example, they addressed situations denied by the authorities and that can nevertheless still be proven to occur – such as the people who ‘disappear’ whilst moving through border checkpoints and massacres unrecognised by official records, and linked this to the disappearance of people off-screen in images and film, when only a portion of the body is seen. The performance identified this non-space as that of ‘zero probability’: a space of collective amnesia where things, human beings and images disappear, but also one where anything can happen – moving the audience’s attention towards events they are not yet able to recognise but which are pregnant with potentiality. Steyerl and Mroué suggested moments of zero probability, which artistically might be impossible to represent, as possible resistant spaces for art and politics to inhabit. In times when the art market can only sustain itself by constantly expanding through the appropriation of new types of artistic media and spaces to present these in, the notion of ‘zero probability’ offers an imaginable space in which art and politics might be able to exist outside of the borders they now struggle within.